Special Offer. Buy 6 Bottles for £45.00 each. Save £15.00 !! Single Bottle Price - £47.50. Lively and generous, Rose Imperial distinguishes itself by a radiant colour, an intense fruitiness and flamboyance on the palate, that instantly seduce and delight. The color is a glowing pink with dominant red tones and purple highlights. The palate is flamboyant and combines intensity and roundness: fleshy and juicy at first, then firm (fruit stone), with a subtle herbal (mint) finish. Rose Imperial’s assemblage is built on the intensity of Pinot Noir (40 to 50%, 10% of which are red wine), the fruitiness of Pinot Meunier (30 to 40%, 10% of which are red wine) and the finesse of Chardonnay (10 to 20%). The use of 20 to 30% of carefully selected reserve wines complete the assemblage and enhance its intensity, subtlety and consistency. 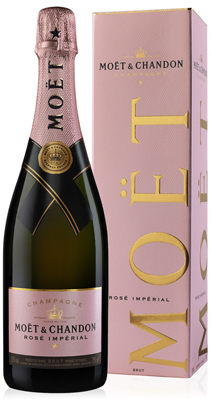 Rose Imperial is the most extrovert and seductive expression of the Moet & Chandon style. It reflects the diversity and complementarities of the three champagne grapes and the richness of the region’s best vineyards to reveal the magic of the world’s most loved champagne. In a Mediterranean spirit, food pairings should be simple and intense in aroma, flavor and color. Grilled shellfish, red-fleshed fish in a thin-sliced carpaccio, grilled or pan-seared, red meat (raw to lightly cooked) in a light sauce, delicious, sun-ripened vegetables and fresh red berries are particularly recommended.